Written by a team of educators with unmatched experience, in collaboration with a consortium of industrial representatives from Black and Decker, Boeing, Caterpillar, General Motors, Grumman, Tektronix, Texas Instruments, Westinghouse, and Xerox, Manufacturing Processes Reference Guide provides thorough descriptions of over 125 of the most important processes available to industry today. This important resource encompasses the entire spectrum of manufacturing, from "Abrasive Jet Machining" to "Wire Drawing." Used with Fundamental Principles of Manufacturing Processes, the two books provide all the information needed to identify the ideal process for a specific manufacturing requirement. "Todd, Allen, and Alting's book is intended to help integrate design and manufacturing engineering activities by providing students of engineering and designers in industry with easily accessible information about common manufacturing processes. The authors rightfully believe that the first step in designing a component is for the designer to become familiar with the processes that will be used in its manufacture. This always leads to more practical, less expensive, and better designed products. [Recommended for] upper-division undergraduate through professional." SCIENCE AND TECHNOLOGY Magazine. Breaks down the treatment of each process into three categories: Knowledge, Application, and Development and organizes each process family based on common characteristics. Comprehensively illustrates, defines, and explains each process to provide the reader with an unequaled understanding of the process and its applications. Encourages an appreciation of the integration of design and manufacturing engineering activities that results in more practical, less expensive, and better designed products for the consumer. 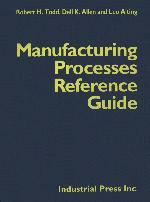 TAXONOMY OF MANUFACTURING PROCESSES. MANUFACTURING PROCESSES. MECHANICAL REDUCTION: Abrasive Jet Machining. Arbor Milling. Band Filing. Band Sawing. Broaching. Centerless Grinding. Circular Sawing. Conventional Blanking. Cylindrical Grinding. Die Threading. Drilling. End Milling. Fine Blanking. Gear Hobbing. Gear Milling. Gear Shaping. Honing. Horizontal Boring. Internal Grinding. Jig Boring. Lancing. Lapping. Lathe Boring. Nibbling. Notching. Parting/Grooving. Perforating. Precision Boring. Punching. Reaming. Reciprocating Filing. Reciprocating Sawing. Routing. Sand Blasting. Shaping/Planing. Shearing. Slitting. Steel-Rule-Die Blanking. Superfinishing. Surface Grinding. Tapping. Thread Cutting. Thread Milling. Turning/Facing. Vertical Boring. Vibratory Finishing. THERMAL REDUCING: Cavity Type Electrical Discharge Machining (EDM). EDM Grinding. Electrical Discharge Machining Wire Cutting (Wire EDM). Gas/Flame Cutting. Plasma Arc Cutting. CHEMICAL REDUCING: ECM Grinding (ECG). Electrochemical Machining (Cavity Type ECM). Immersion Chemical Milling/Blanking. Photo Etching. CONSOLIDATION: Axial Powder Compaction. Blow Molding. Cold Chamber Die Casting. Compression Molding. Cored Sand Casting. Extrusion Molding. Filament Winding. Green Sand Casting. Injection Molding. Investment Casting. Isostatic Powder Compaction. No-Bake Sand Casting. Permanent Mold Casting. Plaster Mold Casting. Rotational Molding. Shell Mold Casting. Thermoform Molding. Transfer Molding. DEFORMATION: Brake Forming. Cold Heading. Deep Drawing. Drop Forging. Impact Extrusion. Plate Roll Bending. Progressive Die Drawing. Progressive Roll Forming. Stretch Draw Forming. Swaging. Thread Rolling. Tube Bending. Tube Drawing. Upset Forging. Wire Drawing. THERMAL JOINING: Electron Beam Welding. Furnace Brazing. Gas Metal Arc Welding (MIG). Gas Torch Braze Welding. Gas Tungsten Arc Welding (TIG). Laser Beam Welding. Metal Bath Dip Soldering. Plasma Arc Welding. Projection Welding. Shielded Metal Arc Welding. Spot Welding. Submerged Arc Welding. Wave Soldering. CHEMICAL JOINING: Adhesive Bonding. ANNEALING: Annealing. Stress Reliving. Tempering. HARDENING: Age Hardening. Carbonitriding. Carburizing. Induction Hardening. Quench Hardening. SURFACE PREPARATION: Chemical Degreasing. Chromate Conversion. Phosphate Conversion. Solvent Degreasing. Ultrasonic Cleaning. Vapor Degreasing. SURFACE COATING: Air Gun Spraying. Electroplating. Electrostatic Coating. Hot Dip Coating. Ion Plating. Sputtering. Vacuum Metallizing. SURFACE MODIFICATION: Barrel Tumbling. INDEX. REFERENCES.